I call this my Bohemian ring because it has that Bohemian look - colorful, playful and that free spirit attitude. It is made of colorful glass beads and it goes so well with my blue jeans and long cotton shirt. The copper base ring was provided by my neighbor who, surprisingly, shares similar interests with me - she's a night owl, watches shows like CSI, Cold Case, Law and Orders and loves to make her own jewelry. So after I moved into my apartment and got to know her, I introduced her to my favorite jewelry stores and she introduced hers to me. 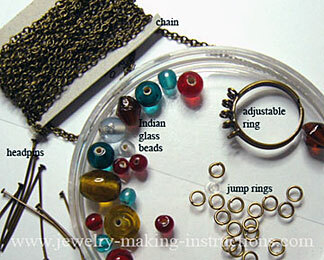 Here's a snapshot of the ring and some of the supplies I used to create it. Click on any of the images for expanded or gallery view. Once we went shopping together for stones and findings - that was a memorable day - We stayed in one shop for so long, and nearly bought the whole store. Most time we visit one another and swap stuff and share jewelry making ideas. When she heard that I was wanting to make a ring, she searched her jewelry boxes and found this copper ring base for me to work on. It's made of copper with an adjustable band and has loops on the top. 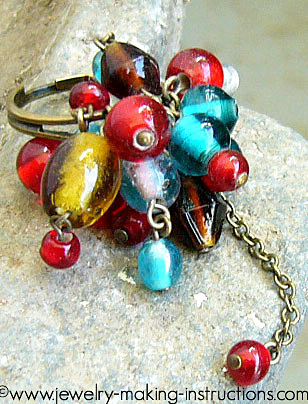 That following night I prepared the glass beads and created this colorful ring. Prepare the glass beads according to the instruction on how to make beaded links and drops . Attach the prepared beads to the ring. 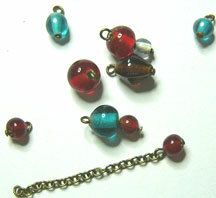 Attach a tiny bead to one end of the chain. Adjust the ring so that it can be easily slipped onto the finger. Now wear it and let the tiny bead dangle on the chain.